Celebrating this year the 50th anniversary of its presence in Europe, Shimadzu emphasizes its Excellence in Science approach through the release of the new “Nexera Bio” solution, a biocompatible Ultra-High Performance Liquid Chromatography (UHPLC) system. It highlights the company’s position of a world leader in analytical instrumentation and a fastest growing mass spectrometry company. Nexera Bio offers the same superior reliability, robustness and expandability as other Nexera series UHPLC systems. It is particularly well suited for analyzing protein-based pharmaceuticals, antibody drugs and other substances developed or manufactured using biotechnologies, such as genetic engineering, cell fusion or cell culturing. The Nexera Bio is compatible with mobile phase solvents containing high concentrations of salts or acids, typically used in the analysis of antibody drugs and membrane proteins, and has also been designed to inhibit peak tailing caused by adsorption to tubing. Such tailing can especially be a problem when analyzing phosphorylated peptides, which have a high affinity for metals. Consequently, the Nexera Bio helps ensure that high-quality data is acquired and analyzed. Protein assays can be problematic for traditional HPLC systems, as some proteins can adsorb onto the stainless steel surfaces. Nexera Bio consists of stainless steel casing reinforced PEEK tubing (poly ether ether ketone), a high-performance engineered polymer with mechanical and chemical resistance properties. It ensures a system pressure tolerance of 66 MPa while maintaining an inert flow path. The ceramic injection needle offers metal-free injections and minimized carryover. By dramatically reducing adsorption to metal surfaces in sample flow lines, the Nexera Bio system achieves much higher sensitivity and better reproducibility than the general-purpose UHPLC system. The accelerated pace of development of biopharmaceuticals and drugs based on mid-sized molecules, such as peptide drugs and antisense oligonucleotides, has spurred a need for more accurate analytical and evaluation technology applicable for use in supplying and developing higher quality pharmaceuticals. Shim-pack Bio Diol and IEX columns offer performance that can help increase accuracy in analyzing and evaluating biopharmaceuticals and drugs based on mid-sized molecules. Available with four different pore sizes, Shim-pack Bio Diol columns are analytical columns suitable for size exclusion chromatography and intended for bioanalysis. They are ideal for analyzing aggregates or separating fragments in antibody drugs, separating nucleic acids or sugar chains, and measuring molecular weight. The Shim-pack Bio IEX is an ion-exchange column suitable for separation of proteins and nucleic acids. Shim-pack Bio IEX columns are available either as non-porous or porous type intended for laboratory-scale purification of small quantities. 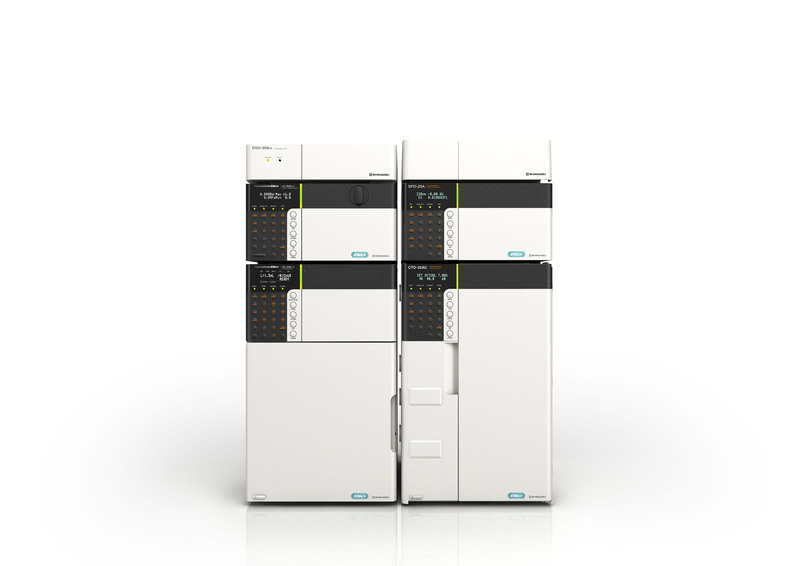 Shimadzu has introduced the new “Nexera Bio” solution, a biocompatible Ultra-High Performance Liquid Chromatography (UHPLC) system. It offers the same superior reliability, robustness and expandability as other Nexera series UHPLC systems. It is particularly well suited for analyzing protein-based pharmaceuticals, antibody drugs and other substances developed or manufactured using biotechnologies. The Nexera Bio is compatible with mobile phase solvents containing high concentrations of salts or acids, and has also been designed to inhibit peak tailing caused by adsorption to tubing. The Nexera Bio is equipped with new and advanced product features such as maximum corrosion resistance, low surface activity and minimized sample loss.